We are still backlogged with Santa Barbara wines from our weeklong adventure in Los Olivos. We did however manage to sample some wines from our local wine shops last week. I reviewed the Tribunal Red Wine 2011 currently in the Trader Joe’s stores, and I think it’s worthy of a purchase at $9.99. I also found a Chardonnay from the Hopland area that I like very much. 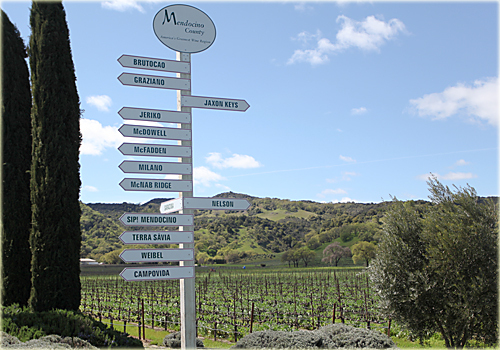 Have you been to the Hopland wine area of Mendocino County? It’s about another 30 miles north of Healdsburg. In Hopland there are 16 wineries making wine from vineyards located in the Sanel Valley, Redwood Valley and the Potter Valley. We have visited all the wineries in this region and three that we like very much are Saracina, McFadden, and Terra Sávia. All are into organic and sustainable farming practices and their wines are excellent values. The problem is that not many of their wines make their way to the wine shops of the San Francisco Bay Area. 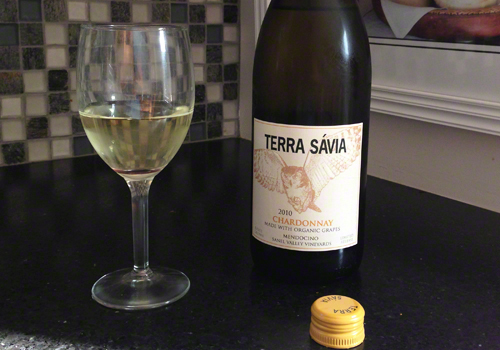 I was surprised and delighted to find the Terra Sávia Chardonnay this past week at Whole Foods Market. For the April Wine Poll on GoodCheapVino we asked what country offers the best wine values and bargains. I live in British Columbia and Tribunal is available at our government liquor stores but at a much higher price. Thanks for that information on the Tribunal. I guess it is not an exclusive wine made just for Trader Joe’s. Thanks a lot for the great Chard review! I’m the Bay Area sales and marketing rep for Terra Sávia as well as part of the family that owns the winery. Needless to say we were stoked on the large purchase for the case stack in that store! Thanks for the writeup on Hopland as well! It is also a plus that Terra Sávia is family owned and is practice organic farming. The wine is very good and deserves recognition.